Samsung Galaxy Tab S4 (SM-T830) and Galaxy Tab A2 XL (SM-T590) are the two upcoming tablets from the South Korean company. The specs and renders of these devices have already surfaced in recent leaks. Recent reports have revealed that the SM-T830 and SM-T835 model numbers belong to the Galaxy Tab S4 and whereas the SM-T590 and SM-T595 are the model numbers of Galaxy Tab A2 XL. These tablets have already acquired certification from the Federal Communications Commission (FCC) in the U.S. Since Samsung’s SM-T830 and SM-T590 devices were certified today by South Korea’s National Radio Research Agency (KRRA), it appears that the arrival of Galaxy Tab S4 and Galaxy Tab A2 XL is drawing near. The NRRA certifications of the Tab S4 and Tab A2 XL haven’t revealed any information on their specifications. However, recent reports have revealed that the Galaxy Tab S4 will be arriving with a 10.5-inch display that supports 1600 x 2560 pixels resolution, Snapdragon 835 SoC, 4 GB of RAM and a large battery of 7,300mAh capacity. The Tab S4 is likely to be bundled with S Pen stylus. The SM-T830 could be its LTE variant whereas the SM-T835 could be its Wi-Fi only model. The Galaxy Tab Advanced 2 XL (shortened as Galaxy Tab A2 XL) tablet is expected to arrive with weaker specs. Recent reports have revealed that it will feature a 10.5-inch display that supports 1920 x 1200 pixels resolution. Compared to the predecessor Galaxy Tab models, the A2 XL is unlikely to feature a physical home button. Instead, it will be coming with on-screen navigation buttons. The device is speculated to be fueled by Exynos 7870 SoC and 3 GB of RAM. It is likely to feature a native storage of 32 GB. The SM-T590 could be the LTE model of the Galaxy Tab A2 XL. 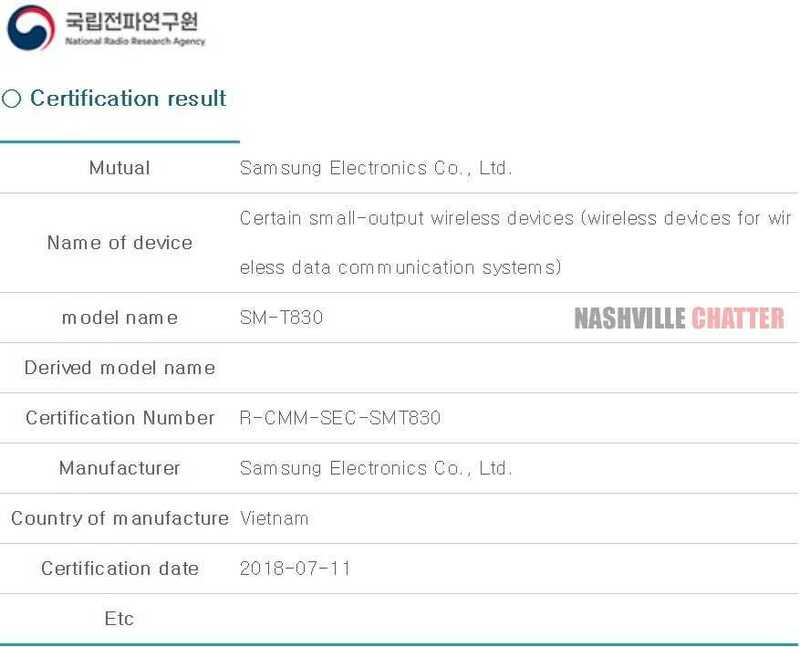 And, the SM-T595 model that has been recently certified by multiple agencies such as EEC, Bluetooth SIG and WFA could be its Wi-Fi only model. Next Next post: Mysterious Vivo 1879 Spotted with Snapdragon 845; Could it be Upcoming Flagship?